Moisturizers are also the most prescribed products in dermatology. A number of herbal moisturizers are floating in the market with effective claims under the bandwagon of naturals. Most of the commercial moisturizer contains Aloe barbadensis (Aloe vera) as a moisturizing agent. Nowadays there so many other herb's extract/juices/oils like grape seed, cucumber, basil, jojoba oil, almond oil, olive oil, etc. present in the commercial moisturizer section claiming for restoring skin hydration and viscoelasticity properties. Consequently, subjective studies to evaluate the moisturizing effect scientifically are necessary to validate these claimed effects. Objective methodologies are considered appropriate to prove and to clarify the mechanisms of action of substances that improve skin properties. Several in vivo studies using modern bioengineering techniques have been performed to evaluate the mechanical properties and water content of the epidermis. ,,, Instruments that have been used for assessing epidermal hydration are based on measurements of conductance,  capacitance, ,,, and impedance  of the skin. Instruments that have been used for testing skin (viscoelasticity) mechanical properties are based on torsion  and suction methods. ,,,,,,,,,, Proof of efficacy can be evaluated in different ways  but testing on human volunteers is the preferred one. By introducing noninvasive instrumental measuring techniques that are applicable on humans, properties of cosmetic and dermatologic products can be assessed in an objective way, making comparisons between results possible and allowing the detection of subtle changes in skin morphology and function otherwise not detectable by sensorial means. The objective of research in herbal cosmetic field is obtaining the best from the nature for better tomorrow. In the present research, noninvasive skin biomechanical and electrical techniques have been used to evaluate the viscoelastic and hydration effects of 20 commercial herbal moisturizers containing different moisturizing actives in the form of herbal ingredients; this assessment would provide support in establishing a strong faith of consumer towards herbal moisturizers. Ttwenty commercially available herbal moisturizers were purchased from local cosmetic dealer at Raipur, Chhattisgarh, India. Out of them, 8 were products from leading abroad manufacturers and 12 were products of top most Indian manufacturers. The products were referred by the codes HM1-HM20. 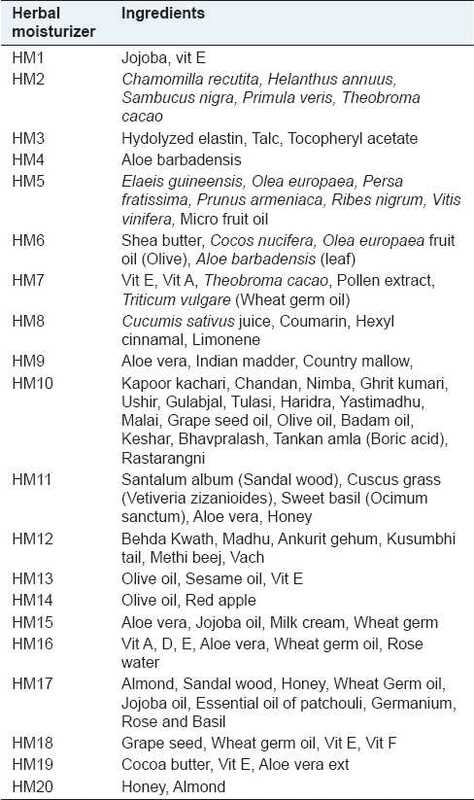 Base ingredients that were indicated on the packages of selected moisturizers are summarized in [Table 1]. Other qualitative ingredients mainly herbal extracts, juices, and oils vary product to product and are listed in [Table 2]. A total of 40 healthy volunteers, mean age 40 ±9 years, were studied after they provided informed consent. A dermatologist determined the skin types of these volunteers as normal to dry. All participating volunteers were found free from any pathological findings on their arms. All test subjects were asked not to use cleansing or skin care products on the volar forearms  for 1 week prior to and during the study. Viscoelastic and hydration measurements were carried out (baseline) before and after the application of the moisturizers (short-term test; 1, 2, and 3h) after a single application. This procedure was followed for a long-term test of 3 weeks, wherein herbal moisturizers were applied 2 times daily in the morning and evening for 20 days consecutively. About 0.2 g of each moisturizer was applied to different test sites, 2 cm in diameter located on the volar forearm. An adjacent untreated skin area served as a control. Cutometer and conductance measurements were then performed 12 h after the last application, i.e, day 21. The measurements were performed in an acclimatized room with a mean relative humidity of 40 ± 3% and a mean room temperature of 23 ± 5°C. They were carried out under standardized conditions as described in earlier  literatures. All measurements were carried out according to the relevant guidelines,  nontreated sites on volar forearm served as controls. The mechanical properties of the epidermis were determined using a noninvasive, in vivo suction skin elasticity meter, Cutometer (MPA 580, Courage and Khazaka, Koln, Germany) equipped with 2 mm measuring probe. The time/strain mode was used with a 5 s application of a constant negative pressure of 500 m bar, followed by a 5-s relaxation period. A typical skin deformation curve is illustrated in [Figure 1]. The following parameters were analyzed: Ue, immediate distension; Uv, delayed distension; (R 0 ) Uf, final distension (skin distensibility); Ur , immediate retraction; R, residual deformation at the end of measuring cycle (resilient distension); (R 2 ) Ua/Uf, gross-elasticity of the skin, including viscous deformation; (R 5 ) Ur/Ue, neto-elasticity of the skin without viscous deformation; (R 7 ) Ur/Uf, biological elasticity, i.e., the ratio of immediate retraction to total distension; (R 6 ) Uv/Ue, the ratio of viscoelastic to elastic distension; and R8, viscopart, i.e., the area under the suction part of the deformation curve. The average values of two measurements were used in subsequent calculations. The curves of the obtained skin deformation values were analyzed using the software of Cutometer MPA 580. Statistical analysis was carried out by using the STAT software, obtained values were expressed as mean ± SD (standard deviation). Viscoelasticity and hydration values of the tested sites were expressed as a percentage of the values obtained for the appropriate control site on volar forearm arbitrarily set to 100%. Analysis of variance (ANOVA) and Student's paired t-tests were performed. Differences was considered statistically significant if P < 0.01 and highly significant if P < 0.001. Electrical measurements by multitester in terms of hydration obtained during short-term study are reported in [Table 3]. Highly significant increases in the water content of stratum corneum readings (P < 0.01) relative to baseline (before, 0 h) were observed 1, 2, and 3 h after single application of all moisturizers [Figure 2]. 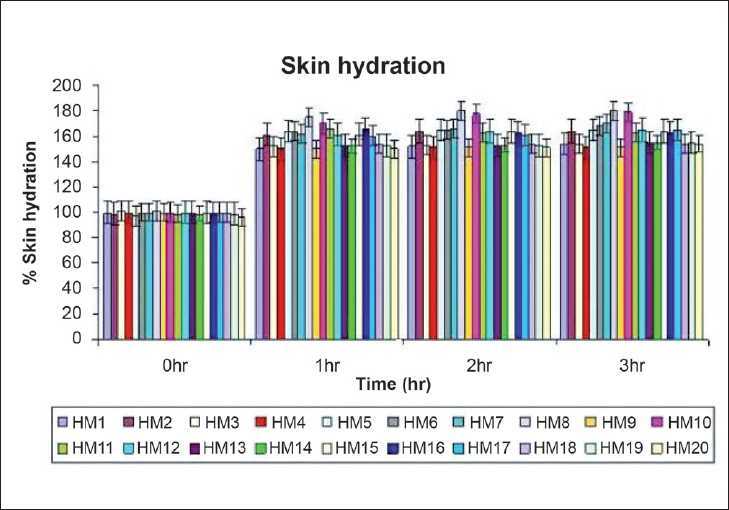 After 3 h of single application of moisturizers, HM8 and HM10 has shown 70-80% increase in water content of stratum corneum, HM2, 5, 6, 7, 11, 12, 15, 17, and 16 has shown 60-70% increase, and 50-55% increase was shown by HM1, 3, 4, 9, 13, 14, 18, and 19 when compared to baseline (control) reading that is set to an arbitrary value [Figure 2]. 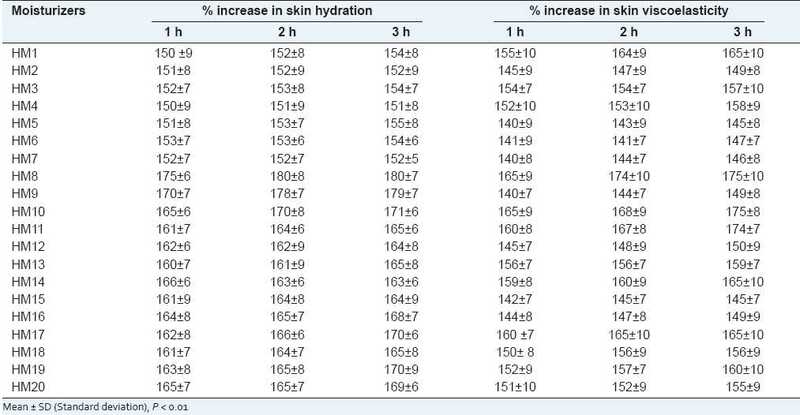 The changes in skin mechanical parameters observed before and after 1, 2, and 3 h after single application of moisturizers is expressed as a percentage increase in the values and are shown in [Table 3]. Significant increase (P < 0.01) in viscoelastic parameters, relative to baseline (before, 0 h) were observed 1, 2, and 3 h after single application of all moisturizers [Figure 3]. The most pronounced changes were observed with moisturizer HM8, HM10, and HM11 (65-75% increase), compared with HM1, 3, 4, 13, 14, 17, 18, 19, and 20 (60-55% increase) and 40-50% increase was shown with HM2, 5, 6, 9, 7, 12, 15, and 16 when compared to baseline [Figure 3]. All participants reported strict compliance with the instructions. 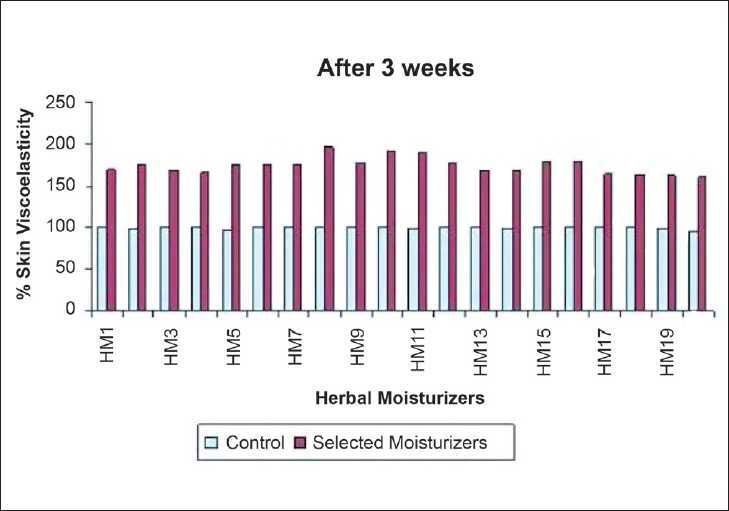 Effect after 3 weeks of daily applications of moisturizers was measured by mutlitester and is reported in [Table 4]. The results obtained after a 3-week period application shown that all moisturizers produced a significant increase (P < 0.001) in skin hydration when compared with baseline [Figure 4]. However, when these moisturizers were compared with each other, the maximum percentage increase in skin hydration was obtained with HM8 and HM10 (95-100%). During study HM2, 5, 6, 7, 11, 12, 15, 17, 16 has shown 80-90% increase and HM1, 3, 4, 9, 13, 14, 18, 19 has shown 60-70% increase in skin hydration after 3 weeks when compared to baseline reading. The changes in skin mechanical parameters observed after 3 weeks of daily application of moisturizers is expressed as a percentage increase in the values and is shown in [Table 4]. The results obtained after 3 weeks were significantly higher (P < 0.001) relative to baseline reading [Figure 5]. The most pronounced changes were observed with moisturizer HM8, HM10, and HM11 (90-95% increase), then with HM1, 3, 4, 13, 14, 17, 18, 19, and 20 (75-80% increase) and 60-70% increase with HM2, 5, 6, 9, 7, 12, 15, and 16 when compared to control [Figure 5]. Effects of various herbal moisturizers on skin bio mechanical and electrical have been observed in terms of short term and long term studies. Skin hydration and viscoelastic measurements are carried before and after 1, 2, and 3 h of application of the product, as it is possible to attain improved skin properties shortly after a single application. Nevertheless, long-term studies (3 weeks) are important to assess the maintenance and enhancement of these effects. The short-term test allows in most cases high discrimination, whereas the long-term test usually shows the real effects the products have on the upper layers of the skin when the product is no longer present. , In both types of test, it is advisable to work with a target group of elderly volunteers as epidermal properties has seen more altered for such persons. For these reasons, we have studied the effect of hydrating and viscoelastic properties of herbal moisturizers in elderly people. In the present study, we adopted a combination of noninvasive bio mechanical and electrical techniques for the measurement of skin hydration and viscoelasticity, respectively. 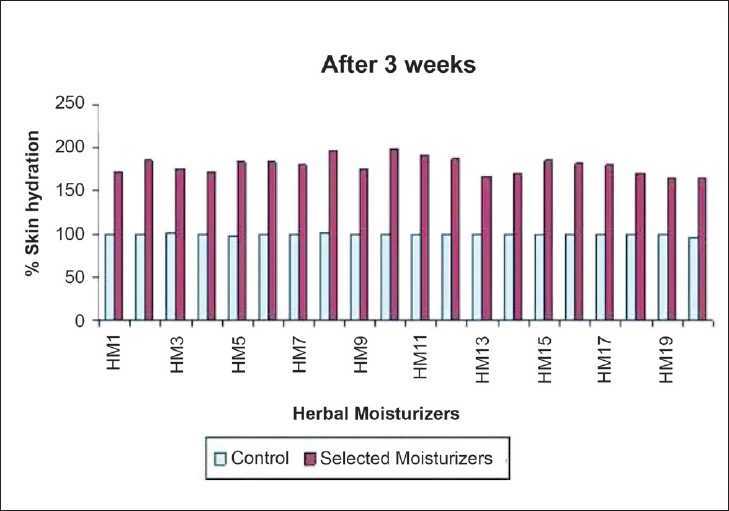 Interpretation of results revealed that there are significant increases in skin hydration and viscoelastic parameters after single application of all herbal moisturizers, which are further increased and maintained after regular application of them upto 3 weeks. Results of our study are in agreement with the report by Li et al. 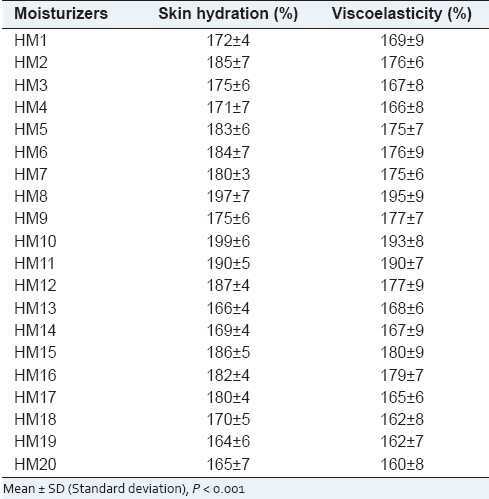 The increase in water content and viscoelasticity could, however, be due to different reasons  associated with various herbal ingredients incorporated in selected moisturizers [Table 2]. Almost all the herbal moisturizer contain aloe vera (Ghrit kumari) extract, which is rich composition in hygroscope mono and polysaccharides  and in the amino acids, which may improve water retention in the stratum corneum. The silica in cucumber (Cucumis sativum) is an essential component of healthy connective tissue, which includes muscles, tendons, ligaments, cartilage, and bone. It is an excellent source of potassium, vitamin C, and folic acid. The high water content makes cucumbers good for moisturizing effect. Methi (Trigonella Foenum Graecum) seed extract contains 45-60% carbohydrates, 5-10% fixed oils (lipids), flavonoids, free amino acids that provide softening, cleansing, soothing properties to skin. Sandalwood (Santalum Alba) the main constituent of sandalwood oil is santalol, credited for its moisturizing and viscoleastictity property. It has been used since earliest times as incense, in embalming and cosmetics. Almond oil (Prunus Amygdalus) contains folic acid, alpha tocopherol, and zinc, which are useful in skin disorders. Wheat germ oil (Triticum sativum); wheat is a rich source of tocopherols with high vitamin-E potency that nourishes and prevents loss of moisture from the skin. Red apple (Pyrus malus); it is a rich source of various vitamins, trace elements, amino acids, and flavanoids due to which it acts as humectant and provide moisturizing and viscoelasticity property. Coconut (Cocos Nucifera) oil helps keep skin soft and smooth. Lauric oils, the dominant fatty acid (45-48%) in coconut oil, are used in cosmetics. Yashtimadhu (Glycyrrhiza Glabra) extract is helpful to formulate cosmetic products for the protection of skin and hair against oxidative processes. Grape seed (Vitis vinifera) contain pycogeneol,  which is responsible for its cosmetic properties. Many traditional herbs have been scientifically evaluated for their cosmetic potential  like Olive oil (Oleum olivae/ Olea europaea), Neem (Azadirachta indica), Tulsi (Ocimum santum), Geranium (Pelargonium graveolen), Kapoor Kachari (Kaempferia galanga), Cuscus grass th (Vetivera Zizanozides, Ushir), Kesar (Crocus sativus), Khumani (Prunus armeniaca), Jojoba (Simmondsia chinensis), and Indian madder (Rubia cordifolia), etc. All products shown high improvement in skin hydration but HM8 and M10 both gave highest hydration of the stratum corneum of elderly volunteers. The high hydration effect obtained by HM8 and HM10 is due to synergetic effect of various natural moisturizing herbs [Table 2]. 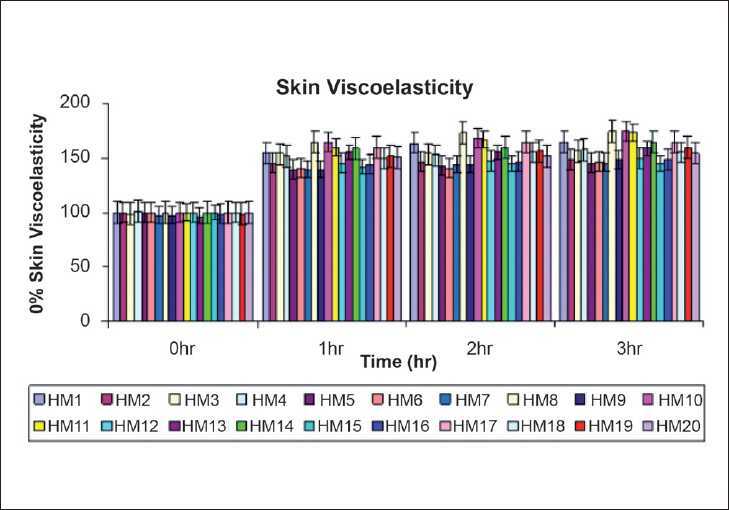 The most pronounced changes in skin viscoelastic property were observed with HM8, 10, and 11 due to increase in Uv and Uv/Ue parameters. 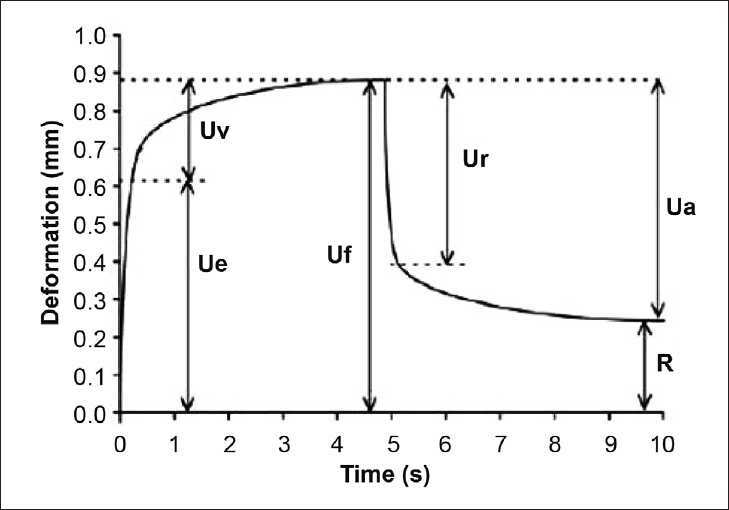 Uv and Uv/Ue represent the viscoelastic part of the skin deformation. , Increase in these parameters values indicates the decrease in the viscosity of the interstitial fluid as a result of the increased water content and changes in the proteoglycan composition and/or structure. The accumulation of water in the dermis diminishes the friction between the fibres and facilitates the movement of the interstitial fluid. Our study also complies that there is a link between skin hydration and viscoelastic parameters (Uv and Uv/Ue). Out of 20 selected moisturizers the pronounced change in both properties of skin has been observed with HM8 and HM10. With HM11 skin hydration did not increase linearly with skin viscoelasticity, this may be due to its ingredient's properties. The present study emphasized on the moisturizing properties of the herbal products. Repeat applications of the formulations induced a higher level of stratum corneum moisturization as compared to single application. However, to maintain these effects, the products must be repeatedly applied because stopping the applications abates the benefit in stratum corneum hydration. Thus, we suggest that the daily use of moisturizers containing herbal extract/juice/oils is important to maintain humectant and soothing effect on the skin. Results of noninvasive skin bioengineering techniques scientifically substantiate the hydrating and viscoelastic claims of commercially available herbal moisturizers. The main objective of this study was to evaluate and substantiate the viscoelastic and hydration effect of herbal moisturizers using noninvasive bio mechanical and electrical techniques. This study highlighted the influence of various herbal ingredients on the efficacy of cosmetic products. We conclude that epidermal hydration produced by moisturizers influences the mechanical properties of skin. Noninvasive skin mechanical and electrical measurements are appropriate for an objective and quantitative evaluation of the complex effect of different dermatological and herbal cosmetic products on epidermal mechanics and water content. Short- and long-term study contributes to select the best performing moisturizers and helps to elucidate the possible mechanism of action lying behind its use. This study can be helpful for upcoming researchers to select herbs for the formulation and evaluation of herbal moisturizers which can be claimed for their efficacy with scientific datas, which shall further give strength to our herbal and cosmetic industries eminence in global market. The authors acknowledge University grant commission [F. No.32-133/2006(SR)], New Delhi for financial assistance. One of the author extend her gratitude towards the head of the cosmetic lab, Institute of pharmacy, Pt, Ravishankar Shukla University, Raipur (C.G.) for providing facilities to carry out research work. 8. Savic S, Tamburic S, Savic M, Cekic N, Milic J, Vuleta G. Vehicle-controlled effect of urea on normal and SLS irritated skin. Int J Pharm 2004;271:269-80. 10. Loden M. The clinical benefit of moisturizers. JEADV 2005;19:672-88. 12. Jemec GBE, Serup J. Epidermal hydration and skin mechanics. The relationship between electrical capacitance and the mechanical properties of human skin in vivo. Acta Derm Venereol 1990;70:245-47. 13. Jemec GBE, Jemec B, Jemec BIE, Serup J. In vivo The effect of superficial hydration on the mechanical properties of human skin: implications for plastic surgery. Plast Reconstr Surg 1990;85:100-3. 14. Overgaard Olsen L, Jemec GBE. The influence of water, glycerin, paraffin oil and ethanol on skin mechanics. Acta Derm Venereol 1993;73:404-6. 15. Pedersen LK, Jemec GBE. In vivo Plasticising effect of water and glycerin on human skin. J Dermatol Sci 1999;19:48-52. 16. Bettinger J, Gloor M, Vollert A, Kleesz A, Fluhr J, Gehring W. Comparison of different non-invasive test methods with respect to the effect of different moisturizers on skin. Skin Res Technol 1999;5:21-7. 18. Jemec GBE, Wulf HC. The plasticising effect of moisturizers on human skin in vivo: a measure of moisturizing potency? Skin Res Technol 1998;4:88-93. 19. Jemec GBE, Wulf HC. Correlation between the greasiness and the plasticizing effect of moisturizers. Acta Derm Venereol 1999;79:115-7. 20. Murray BC, Wickett RR. Sensitivity of Cutometer data to stratum corneum hydration level. A preliminary study. Skin Res Technol 1996;2:167-72. 21. Murray BC, Wickett RR. Correlations between Dermal Torque Meter, Cutometer, and Dermal Phase Meter measurements of human skin. Skin Res Technol 1997;3:101-6. 22. Colipa: Guidelines for the evaluation of the efficacy of cosmetic products. Scientific information brochure. Brussels: Colipa; 1997. p. 10. 23. Kapoor S, Saraf S. Efficacy study of sunscreens containing various herbs for pro-tecting skin from UVA and UVB sunrays. Phcog Mag 2009;4:238-48. 24. Bazin R, Fanchon C. Equivalence of face and volar forearm for the testing of moisturizing and firming effect of cosmetics in hydration and biomechanical studies. Int J Cos Sci 2006;28:453-60. 25. Rogiers V. TEWL-measurements in patch test assessment: the need for standardisation. In: Elsner P, Maibach HI, editors. Current Problems in Dermatology Irritant dermatitis, new clinical and experimental aspects. Basel: Karger; 1995. p. 152- 8. 26. Berardesca E. EEMCO guidance for the assessment of stratum corneum hydration: electrical methods. Skin Res Technol 1997;3:126-32. 27. Nicander I, NyreͲn M, Emtestam L, Ollmar S. Baseline electrical impedance measurements at various skin sites- related to age and gender. Skin Res Technol 1997;3:252-8. 28. Ashawat MS, Saraf S, Saraf SL. Preparation and characterization of herbal creams for improvement of skin viscoelastic properties. Int J Cos Sci 2008;30:183-93. 29. Belo SED, Gaspar LR, Gonc PMBΈ Campos AM. Moisturizing effect of cosmetic formulations containing Aloe vera extract in different concentrations assessed by skin bioengineering techniques. Skin Research and Technology 2006;12:241-6. 30. Paepe KD, Derde MP, Roseeuw D, Rogiers V. Claim substantiation and efficiency of hydrating body lotions and protective creams. Contact Dermatitis 2000;42:227-34. 32. Femenia A, Sanchez ES, Simal S, Rossello C. Compositional features of polysaccharides from Aloe vera plant tissues. Carbohydrate Polymers 1999;39:109-17. 33. Rieger M. Skin constituents as cosmetic ingredients. Cosm Toil 1992;107:85-94. 34. Tisserand R. The Art of Aromatherapy. C.W.Daniel and Co. Ltd. ISBN 0-85207-140-X. 1987. 35. Edward C, Craig RE. Cocos nucifera (coconut) traditional tree initiative-species profiles for pacific island agroforestry, www.traditionaltree.org. Available from: http://www.agroforestry.net/tti/Cocos-coconut.pdf.2006 . 36. Council of Europe. Plants preparations used as ingredients of cosmetic products, Strasbourg Cedex: Council of Europe Publishing; 1994. 37. Dureja H, Kaushik D, Gupta M, Kumar V, Lalther V. Recent trends in cosmeceuticals. Int J pharmacol 2005;37:155-9. 38. Kole PL, Jadhav HR, Thakurdesai P, Nagappa AN. Cosmetic potential of herbal extracts. Natural Product Radiance 2005;4:315-21. 39. Barel AO, Courage W, Clarys P. Suction method for measurement of skin mechanical properties: the Cutometer. In: Serup J, Jemec GBE, editors. Handbook of non-invasive methods and the skin. Boca Raton: CRC Press; 1995. p. 335-40. 40. Elsner P. Skin elasticity. In: Elsner P, Wahlberg JE, Maibach HI, editors. Bioengineering of the skin: methods and instrumentation. Boca Raton: CRC Press; 1995. p. 53-64. Rahmanian-Schwarz, A. and Knoeller, T. and Held, M. and Just, L. and Schaller, H.-E. and Hirt, B.
KoraÄ‡, R.R. and Khambholja, K.M.